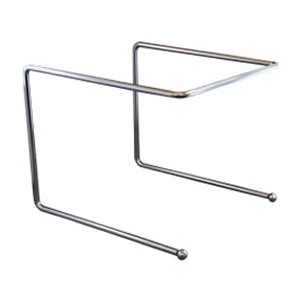 Add a little height to your presentation with these stainless steel pizza stands. Create more room on your table by elevating your masterpiece for all to see. Our universal pizza stand is another classic item you will want for your restaurant or home pizzaria. Showcase that delicious, designer, artisan pizza that you’ve just made for your family and friends with this pizza tray stand! Rather than just flopping your pizza down on the table, display it with the confidence Let everyone see the beautiful creation that you’ve made and it’ll entice them to make a pizza themselves. It also keeps your hot pizza and hot pizza tray off of your wooden tables that can warp from too much heat!